Now, back to tables. My goodness they are big now! Lucky for you all, I ordered the video of cross-country, so I can spare you all the details of our course on here and just let you watch it…but briefly, our course was big and technical right from the start, with some tough combinations very early on. I know Pirate is honest, but on first walk I thought, “Holy cow! Are we going to get everything right to all these skinnies/chevrons/triple brushes the first time? !” I walked all the options and had definite plans to take a few of them unless things were going really, really well. Why I ever questioned that they would is beyond me. 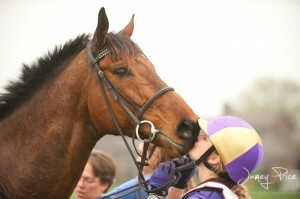 I mean, duh, didn’t I go into this knowing I have the best horse in the world? (I realize this is an arguable point, but I dare you to challenge me on this! Besides, Pirate proofreads this blog). From the beginning, P locked onto his skinnies from way back, holding his lines like an old pro and landing over every fence looking for the next one. It was one of the most incredible feelings I have ever experienced. We weren’t much of the way around the course when I said, “Option? WhatEVER! !” because as you all know, plans change on cross-country very quickly. The horse I had underneath me that day was looking for the direct routes, and I didn’t want to pull him off of them. Pirate is such a clever horse in the way he sizes up a question as we approach it and seems to have it figured out in a matter of seconds. 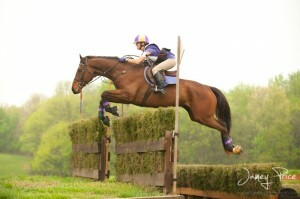 As he has come up through the levels and matured, my job as his rider has gotten easier and easier. But part of my job lies in making the best decisions for him, not just for the day, but for the future. He may be the nicest horse I ever have the privilege to ride, and it’s vital I don’t do anything to break the trust he has in me. As a wise event rider said to me, it is always better to be a horseman than a hero. So, bold though he may be, Pirate is new to the level and relatively young, and I chose to give him an educational experience on cross-country and take him around rather slowly, allowing him time to process and truly understand what it was that was being asked of him at each question. Though a part of me wanted to be more competitive and try to make time, I feel quite strongly that taking our time now will allow us to be that much more competitive in the future, at a time when it really counts. For this time out, I’m just happy to report that we came in clean, having taking all the direct routes without question…and we had a BLAST out there. Needless to say I was walking on air all day, and after spending a ridiculous amount of time loving on Pirate and feeding him more cookies than even a fat Thelwell pony could handle, I got to enjoy a bit of time with the huge group of friends who came out to cheer us on. I was overwhelmed by the number of students, friends, and family members (aren’t they all one & the same?) who came out to support us, many of whom made their way back to the stables to help take care of Pirate. He has a huge fan club and I feel unbelievably fortunate to have such a great group of people behind us every step of the way. Their support and encouragement means more to me than I could ever say. So what’s next on the list for us? Well, to be honest, we’ve sort of run out of money in the ol’ horse trial fund for the moment, so it looks like most of the spring we will focus our efforts on continuing our education with some dressage lessons (I’ve only taken a precious few with Pirate), and a hitting a local Jumper show or two to improve in the stadium phase…oh yeah, that. I am ever so pleased to report that on show-jump Sunday, Pirate was the most settled and relaxed he has ever been in that phase. Unfortunately, though, it would appear I don’t know how to ride him when he’s that quiet, because we pulled several rails. The round felt nice enough, but having fences down doesn’t exactly look good on paper, so we need to tighten up. (Waiting on the video to see just how it did look, actually). Well, at least it’s open to dinner table discussion. (Casual silverware in use). 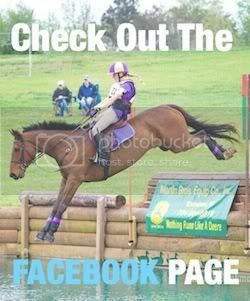 Posted in Blog and tagged with 3 Day Eventing, Cross Country, Dressage, Kelsey Briggs, Kelsey Briggs eventing, Show jumping, TCI **, The Fork Horse Trials, The Gentleman Pirate, Three Day Eventing, two star eventing, USEA. RSS 2.0 feed. One Response to The Fork, and all other Utensils.